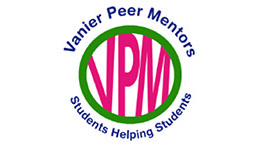 The Vanier Peer Mentors are successful upper-level students from Vanier-affiliated programs who are trained to successfully integrate incoming students to York University and help all students academically, while building the academic skills they need to succeed in university. What differentiates this program from others is that a fellow student (a peer) is assisting the student in need. The Peer Mentor acts as the ideal intermediary between students and university success, and therein lies the value of the Peer Mentor Program. How to contact us? E-mail (vcmentor@yorku.ca), phone (416-736-2100, ext. 40028), in-person office visits (Vanier College Rm. 121) or on Facebook. What programs do we serve? BUSO; CHST; ECON; HUMA; PHIL/COGS & affiliated programs; and UNMA. You do not have to meet with a specific Peer Mentor; however, if you have a program specific question, view our schedule.